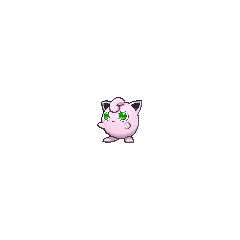 Jigglypuff in game: 1,321 Who? Important notice! Pokemon Jigglypuff is a fictional character of humans. Jigglypuff is a round, pink ball with pointed ears and large, blue eyes. It has rubbery, balloon-like skin and small, stubby arms and somewhat long feet. On top of its head is a curled tuft of fur. As seen in Pokémon Stadium, it is filled with air, as a defeated Jigglypuff, deflates until it is flat. By drawing extra air into its body, it is able to float as demonstrated in Super Smash Bros.
Jigglypuff uses its eyes to mesmerize opponents. Once it achieves this, it will inflate its lungs and begin to sing a soothing lullaby. If the opponent resists falling asleep, Jigglypuff will endanger its own life by continuing to sing until its lungs run out of air. It is able to adjust the wavelength of its voice to match the brain waves of someone in a deep sleep. This helps ensure drowsiness in its opponents. 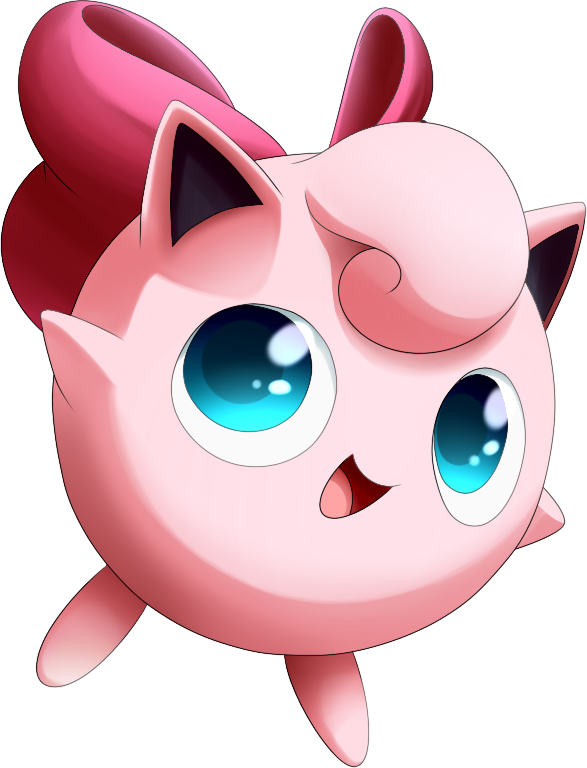 Jigglypuff can mostly be found in lush green plains and grassy meadows. From The Song of Jigglypuff through the end of the original series, a wild Jigglypuff followed Ash and his friends, intent on performing its trademark song without causing its audience to fall asleep. It rarely, if ever, succeeded. Jigglypuff would scribble all over the faces of anyone who fell asleep after hearing the song. After Johto, Jigglypuff started to only appear very rarely. It reappeared being featured in one early Advanced Generation series episode. A giant Jigglypuff appeared at the end of The Ancient Puzzle of Pokémopolis. Marina has a Jigglypuff nicknamed Pink. She used it to battle Jimmy's Beedrill and in a Pokémon Contest with Wani-Wanilater on. Another Jigglypuff was featured in Rough, Tough Jigglypuff. Mitch Mitchum wanted to catch it for his daughter's birthday. Ursula has a Jigglypuff which she used in Yes in Dee Dee, It's Dawn! during the Double Performance required for the Daybreak Contest along with her Gabite. A Jigglypuff appeared in Performing with Fiery Charm!, under the ownership of Gena. A Jigglypuff appeared on a computer animation in Pokémon Emergency!. A Jigglypuff was used by one of the students of the Pokémon Trainer's School in Gonna Rule The School!. A Jigglypuff appeared in the opening of Destiny Deoxys. A Jigglypuff appeared in The Saffron Con! as a Pokémon owned by a Coordinator. A Jigglypuff made a brief appearance under the ownership of a Trainer in the Lily of the Valley Conference in An Old Family Blend!. A Jigglypuff appeared as a plush toy in A Jolting Switcheroo!. A picture of Jigglypuff appeared in a book in a flashback in Lights! Camera! Pika!. A Jigglypuff appeared in Party Dancecapades!, under the ownership of a Pokémon Performer participating in a dance party. Two Trainers each owned a Jigglypuff, which appeared in The First Day of the Rest of Your Life!. 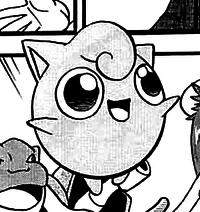 A Trainer's Jigglypuff appeared in SM006. 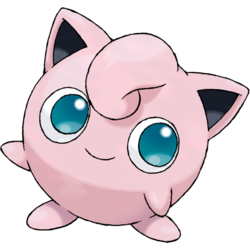 Green of Pokémon Adventures has a Jigglypuff nicknamed Jiggly which first appeared in Tauros the Tyrant. She is her starter Pokémon and is capable of swelling up to several times her size, allowing Green to float with her like a hot-air balloon. In the FireRed & LeafGreen chapter, she evolved into a Wigglytuff.